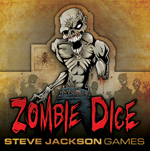 Zombie Dice is out of here! The game was way more popular than we expected . . . yet again. We've shipped our very last sets and now our primary warehouse has ZERO available. But do not fear -- we have a new printing on the way, with a new, more durable plastic cup. More details next month!